Home Opinion Mr President, Where Is Leah Sharibu? 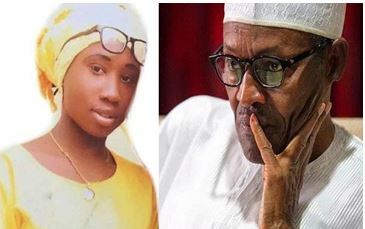 Mr President, Where Is Leah Sharibu? AS we approach the next general elections coming up in a couple of days from now in Nigeria, one of the questions that should agitate our mind is “Where is Leah Sharibu?” We have not acted like enlightened people in discussing issues preelection. This is one topic that should have come up in the discourse, but shamefully left out. In saner clime, this would have been made a subject of discussion and negotiation. But since in this clime, human life matters nothing, we have all swept this important issue under the carpet. The Buhari’s government strong point called in sales and marketting palance, Unquie Salling Point, USP, was the issue of security. The government that it replaced was said to have performed woefully on that score, that Buhari and his cohort capitalized on it and made very suprious promises, they have woefully failed to deliver, but shamelessly claiming they have delivered. There could be no auspicious time than now to demand from the President, what has become of our daughter Leah Sharibu, particularly as he aspires to go for a second term in office. We will recall that Nigerians woke up on February 19, 2018, to the horrific news of Boko Haram’s abduction of 111 girls from their school the Government Girls Science and Technology College in Dapchi, Yobe State, in North Eastern zone of the country among whom is Leah Sharibu. As it is typical with Nigerians, we have made the initial noise and have all returned to our usual business. The government have not fared better either. But alas, God has provided for us a time, to me an auspicious one, to hold our leaders accountable. This is indeed the time to ask the President to account for his stewardship. And one of those things we should ask is, where is Leah Sharibu? If the President does not provide a credible and concrete answer, that should determine his fate in the forthcoming elections. Therefore, the President must take every action necessary under the sun to bring back Leah now. If the President fails to bring back Leah, we may just forget that she ever existed. The kidnap debacle of a hundred and eleven girls in Dapchi, to me was conceived and executed by the same actors that staged managed the Chibok kidnap episode. While the Chibok incident was done to blackmail the infamous Jonathan’s government, the Dapchi case was a publicity stunt and gimmick to enhance and boost the image of Buhari, but mismanaged that it became a publicity stunt which turned out to be his albatross. How can one explain that of the hundred and eleven girls abducted from their school dormitory, only one and the only Christian girl, was kept behind in a negotiated settlement? What explanation can we possibly give on the images that was shown on television of the return of the kidnapped girls. They were so well dressed and with nylon bags as if they were returning from a picnic? How can one explain that the military check point in the town was removed just moments before the abductors came in to carry the girls? How can one explain that the abductors brought back the girls and drove triumphantly into the town, while our military applauded them? How can a government that is alive to its responsibilities and mindful of the sensitivities and mode of the citizen, could have gone to negotiate for all the other girls except the only Christian girl among them? This is particularly painful against the backdrop of the statements made earlier by Buhari, to the effect that they the terrorist should be treated as dignitaries, his actions and attitude towards the Christians? Is it thinkable, is it rational, is it sensible and does it make for a responsible and fair expectation for them to allow the only Christian girl to remain in captivity, while they brought back the Muslim girls? Think of it, a month after their abduction, the federal government secured the release of 105 of the girls all Muslim, and left behind the only Christian girl, Leah Sharibu, who would have been the 106th girl to be freed. We were told that she was left behind for refusing to denounce her Christian faith, and a government accepted such lame excuse, not minding the sensitive nature of that. Was the government expecting that it would be praised? The money that the government paid to the terrorist, was it contributed by Muslims? This is the President who on the date of his inauguration said, “I am for everybody, I am for nobody”. Has he realized that by this action amongst his many asymmetric others, that he is for the Muslims? And this is a country that the constitution said is a secular nation! This government has given the citizen little thread to hold on to. Aside the lame excuse given by the government for their refusal to bring back Sharibu, the government has provided no reasonable, logical and sensible excuse why her release was not secured along with that of other girls and why she could not be freed using the same “back channel” it explored for the other girls. Was Sharibu abducted because she is a Christian? So, why would that be a factor in her release? With the acute lack of information, except for the occasional glimpse from Boko Haram videos or audios releases, not much has been heard about the remaining Chibok girls. But Leah Sharibu’s parents and all of us hope that her fate will be different. The father, Nathan Sharibu, once said he has been barred from speaking to the media, even though he won’t say by whom. A demographic analysis showed that in both Chibok and Dapchi episodes, the insurgents deliberately targeted female students. This action, although blatantly criminal, has both sociological and ideological undercurrents. Boko Haram, loosely meaning western education is forbidden, has been waging war against the Nigerian nation. At a point they declared a large swathe of Nigerian territory in the northeast as its caliphate. With its members drawn from its immediate locality and then radicalized, the girl child who wants to escape the grip of poverty in the region becomes an easy target. Access to education in northern Nigeria is still alarmingly very low and abysmally poor. Africacheck.org reports that only 4 per cent of female children complete secondary school in northern Nigeria, while two-thirds of girls in the region “are unable to read a sentence compared to less than 10 per cent in the South. In Yobe state, where Leah comes from, 77.4 per cent of girls are not in secondary school. By this disgraceful figure, the state ranks the third highest in the Northeast region and the fifth highest among the 10 northern states covered in the report. Yet the central government whose responsibility it is to secure the territorial integrity of the nation, now exhibits a nonchalant attitude. We have often been told by the government spokesman Garba Shehu that the President was concerned about Leah’s plight and that he was working to ensure she is freed. When will that be, if not now? For the President and his handlers, her released should have been now. 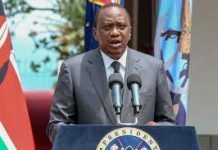 Sanctimonious sentiment by the President should have been back by concreate action at this time, if this government had any iota of seriousness in the matter. All the President’s assumed “worry” is ungratifying, and seen as a part of the usual government’s reactionary rhetoric. It is on record that Buhari undignified assurance and indeed his government comments only comes, when the insurgents released video or audio clip. The last of such was when the girl pleaded with the government to secure her release from her abductors. Unfortunately, their talks have not been backed by serious action. And now is the time for the citizen to ask the President to march his words with concrete action. It is on record that prominent people have made calls to the government of Buhari to do all it can to get Leah back to her parents. The Sokoto State Governor, Aminu Tambuwal called on the Federal Government to deploy “every reasonable tool at its disposal” to ensure the safe return of the abducted Leah Sharibu. The Nigerian House of Representatives in its resolution called on the Federal Government to speed up efforts for the urgent release of Leah Sharibu, and Alice Loksha the remaining aid worker held by the Boko Haram insurgents, before it is too late. The resolution came after the execution of another aid worker, Hauwa Liman, was killed by the insurgents. The presidential candidate of the Peoples Democratic Party, Atiku Abubakar, also called on the Federal Government to immediately rescue Leah Sharibu from the grip of Boko Haram before it is too late. Atiku made this call on his Twitter handle while reacting to the killing of an aid worker, Hauwa Liman by the terrorist organization. Religious clerics in Nigeria have appealed to the abductors of Leah Sharibu to release her without further delay. Yakubu Pam, a reverend and the chairman of the Christian Association of Nigeria, CAN, Northern Nigeria, and Mohamed Khalid, the chief imam of Apo Legislative Quarters, made the appeal at a press conference on the sidelines of the Interfaith Conference in Abuja, on Friday, October 12, 2018. Again, religious leaders under the aegis of Interfaith Initiative for Peace, IIP, have also in Abuja, appealed to the abductors of Leah Sharibu to release the girl and abandon their threat of executing her. If these local appeals could not move the government, one would have expected that calls by international figures would spur the government. 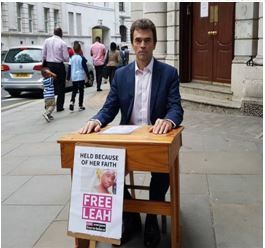 It is on record that on the 200th day of the abduction of Leah Sharibu by Boko Haram, a UK member of Parliament, Thomas Brake called for her release. He made the call when he participated in the 200-hour #Freeleah campaign that was held outside the Nigerian High Commission in London. Also, in a report by the Premier Christian Radio, the House of Commons discussed Sharibu at plenary. A member of parliament for Carshalton and Wallington, Tom Brake, requested the Secretary of State for Foreign and Commonwealth Affairs, to update them on his department’s discussions with Nigerian authorities on the prolonged detention of Leah Sharibu. In a response to a question, Harriett Baldwin, the Minister of State for Africa’s at the Foreign and Commonwealth Office, said the Foreign Secretary spoke with the Vice President of Nigeria Yemi Osinbajo, a Christian Pastor, a law professor and a Senior Advocate of Nigeria, the equivalent of Queens Counsel in the UK, on February 26, and extended an offer of additional support from the UK government. As is normal with Nigerian government, the Foreign Secretary only got a rhetorical answer to wit, “Attacks on schools and abductions of children are abhorrent and must stop. The government of Nigeria is making all efforts to secure her release”. Despite this rhetorical answer, Harriett Baldwin, re-echoed the UK government resolve to help Nigeria in her trying times with insurgency. She told the parliament that “The UK is resolute in its support for Nigeria in the fight against Boko Haram, and are providing a substantial package of intelligence, military and humanitarian support to assist in the response to the ongoing conflict,” she affirmed. In one of the avalanches of calls on the Buhari’s government for the release of Leah, the founder of Oodua People’s Congress, late Dr. Frederick Fasehun, asked President Buhari to ensure that Leah Sharibu, be reunited with her family. Fasehun said it was unfortunate that after negotiations with government representatives, Boko Haram returned only 104 girls to Dapchi, amid reports that five captives died in transit, while Miss Leah Sharibu, is being held for refusing to renounce her Christian faith. His group in a statement by Edith Yassin, Nifemi Onifade, and Gapani Yanga admonished President Buhari to focus on rescuing the hostages. It noted that, “During the Goodluck Jonathan Administration, our advocacy was treated with scorn, instead of focusing on measures to rescue the girls from the terrorists”. To them, the advent of the Buhari’s Administration had brought glimmers of hope with a spate of rescues. Sadly, that enthusiasm has been diminished by an apparent complacency to complete the task at hand”. The Bring Back Our Girls, BBOG, asked the President to focus on governance and expedite the liberation of the Chibok schoolgirls, including Leah Sharibu of Dapchi. Angered by the lackadaisical attitude of the International Committee of the Red Cross and the United Nations Office of the Coordination of Humanitarian Affairs, the group accused them of not doing enough to rescue their workers abducted by Boko Haram in 2018. In their words, “We believe that if these three ladies were foreign nationals, the handling of the situation by both organizations would have been more proactive. There must be a greater commitment on the part of both organizations beyond issuing press statements,” the group asserted. The BBOG noted that it was evident that the insurgency was far from over, adding that long-standing issues of poor feeding, non-payment of stipends, inadequate manpower, and poor intelligence were affecting the morale and fighting capabilities of the security forces in the North-East. It asked the ICRC and UNOCHA to liaise more effectively with the Federal Government to ensure that the surviving hostage, Alice Nggadah, was not killed by the insurgents. The question is how would one expected outsiders to cry more than the bereaved? The government of Nigeria has been very lukewarm on this matter, so the international communities will only dance according to your drumbeats. Yet the absurdity will not seize to happen in Nigeria. The military that is unable to handle the insurgent satisfactorily, is deployed to tackle and maim unarmed civilian. Irony of stupidity. 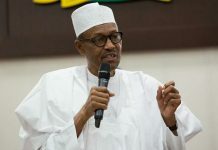 Buhari on Wednesday, April 11, 2018, while receiving the Archbishop of Canterbury, Justin Welby in London, said he was trying to be careful in order not to fall into the hands of fraudsters while trying to secure the release of the abducted Christian school girl, Leah Sharibu, who was not released by the Boko Haram because she refused to renounce her faith and joined Islam as was demanded by her abductors. Haba! The government in negotiating the release of the Muslim girls, did not fail into wrong hands. Is Leah not kept by the same group that released the Muslim girls? Again was she kidnapped for being a Christian? Which wrong hands was the President referring to? With the elections approaching, all hands must be on deck to ensure the President expedites action to rescue Leah immediately. The call by Most Rev. Segun Okubadejo, the Diocesan Archbishop of Ibadan Province of the Anglican Communion, for the electorate to focus on electing credible candidates and not parties, should now move to a higher gear, to compel Buhari to act. This issue must now be in the front burner of the campaign. *Ebongabasi Ekpe-Juda is a Medical Sociologist and a social commentator and is the author of the book The Bewitched Church.